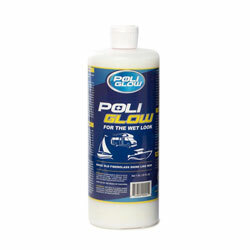 Poli Glow is a proven concept in boat polish and is NOT a "wax." It is easily applied. It wipes on without the need for rubbing or buffing. It will not wash off with soap and water and lasts for over 12 months! Do not treat Poli Glow like a wax. Apply Poli Glow, instead like a paint or varnish. It should be applied to the surface gently. Do not push down on applicator, this may cause foam or bubbles which may dry rough. Do not stop applicator, instead pull away from surface gradually. If drips occur, remove them with applicator before they dry. Avoid windy conditions. Now it is time to apply Poli Glow. This is the easy part. Apply Poli Glow to the applicator and allow a minute to soak into applicator. Pick a small 2' x 2' flat surface to see what Poli Glow will do. Working in small sections (3-4 foot), lightly wipe Poli Glow onto the surface in thin, even, overlapping strokes. Make sure application is dry, approximately on minute at 55° - 95° F, before applying the next coat. If you go over Poli Glow before it is dry you will get brush marks. Apply a minimum of five coats. The first two or three coats may appear dull or streaky due to penetration into the fiberglass. Poli Glow may be applied in direct sunlight except with dark colors. When overlapping you may see areas that are shinier. They will disappear in 24-48 hours. Avoid contact with rain for several hours. If water spots occur they will disappear after a few hours in the sunlight. Maintenance : Poli Glow is a unique product. It will not wash off or be affected by soap and water. A mild boat soap will keep your boat shiny and clean. To maintain a shine for more than twelve months, reapply one or two coats at the beginning and end of each season or every 4 to 6 months. To re-apply, clean boat with soap and water and apply Poli Glow. If stains are left on the surface and penetrate Poli Glow, use Clenz-All to remove stains. Then re-apply Poli Glow. If scratches or wear spots occur, they can be touched up by applying a few coats of Poli Glow. Maintenance is easy, as dirt and grime will not adhere to Poli Glow finish. Avoid contact with ammonia based products, degreasers, teak or hull cleaners and abrasive cleaners.